Prominent & Leading Manufacturer from Pune, we offer modular floor standing extensible enclosure, modular floor extensible enclosure and industrial modular floor standing extensible enclosure. As one of the leading entity of this domain, we are engrossed in providing supreme quality Modular Floor Standing Extensible Enclosure. This enclosure is made of using metal sheet and aluminium alloy. 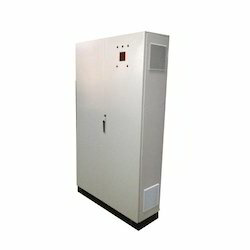 On clients’ demands, this enclosure can be developed using stainless steel materials along with applying custom design. Moreover, the enclosure is manufactured adhering to industry standards, and by implementing strict quality checks on the enclosure. Offered enclosure has been designed to provide comfort and easy working to the clients. The strongest construction in the enclosures. 100% modularity. Doesn’t require more pre-engineering at customer end. Punched holes having pitch of 12.5mm. Depth-adjustable mounting of component plate and transformer / choke channels on a 25mm pitch. Which rests on member of frame structure and thus load is transferred to base. Mounting nut bolts are used only to hold it vertically. Fire retardant & chemical resistant Polyurethane foamed D type gaskets (workability at 100ºC temperature) on doors and covers for better IP protection. Universal mounting of doors and covers so that they can be interchanged or reverted, Structure (skeleton) of the enclosure also can be reverted. Clamped and folded gland plates in parts for easy removing and fitting. Gland holes not necessary to decide earlier, can be drilled at site also. Sheet metal folded base looks attractive with ease in grouting (Grouting holes visible). Removable base covers are also in 3.00 thk. Push the enclosure on round pipe width wise or depth wise. 4 point locking arrangement with rotating centralized lockable handle by lever key to restrict unauthorized access (option of 2 bit key operated lock). Eye bolts are fitted in strongest corner pieces which are firmly welded to all. We have exclusively placed ourselves as a reliable company, involved in providing a reliable range of Industrial Modular Floor Standing Extensible Enclosure. 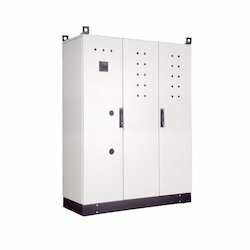 The offered enclosure is highly valued amongst our valuable clients for its high strength and sturdiness. The provided enclosure is available in various sizes and dimensions to meet the various demands of the customers. 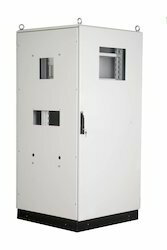 This enclosure can be customized to fulfil the exact requirement of our respected clients. Looking for Modular Floor Standing Extensible Enclosure ?